Afghan men carry their belongings after an earthquake in Takhar province, northeast of Kabul, Afghanistan, Tuesday, Oct. 27, 2015. 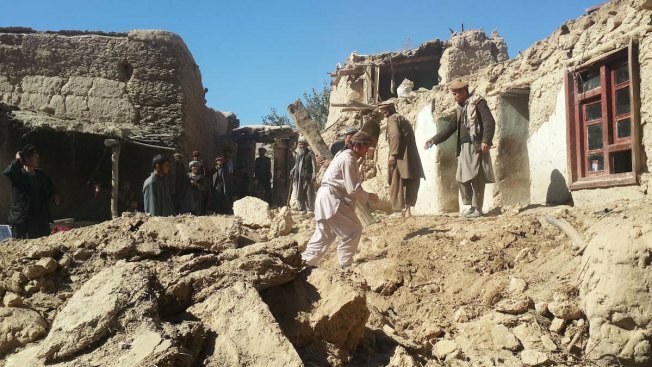 Afghanistan and Pakistan are scrambling to rush aid to survivors of this week's magnitude-7.5 earthquake as the region's overall death toll from the temblor rose to 385. Pakistan's disaster management authority says the nation's dead now are at 267, with 220 people killed in the northwestern Khyber Pakhtunkhwa province and another 47 elsewhere in the country. Afghanistan has reported 115 dead, while three people died on the Indian side of the disputed region of Kashmir. In battered northwestern Pakistan, more than 10,000 homes were damaged, as well as 147 schools. The quake, which struck Monday, was centered in Afghanistan's sparsely populated Badakhshan province bordering Pakistan, Tajikistan and China. Funerals of the victims continued Wednesday and in Pakistan's worst-hit town of Shangla, residents have demanded the government's help to rebuild homes.